Slate Vinyl Top Interlocking Floor Tiles. Easy basement flooring option that can be installed by a home owner or handyman. With a light slate appearance, the Basement Light Peak tile contributes to the bright and inviting atmosphere every homeowner aims to have for their basement. Each tile interlocks together with a four loop-to-peg interlocking system. 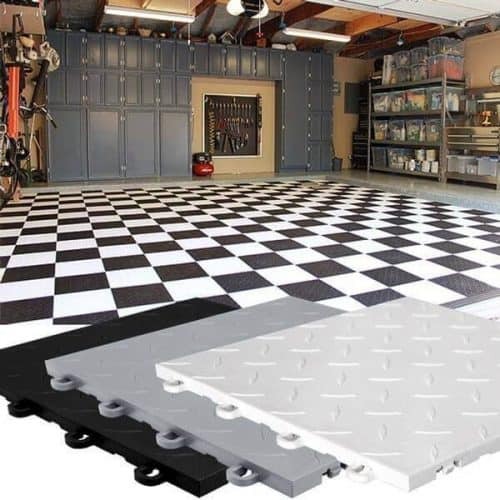 Aside from the convenient interlocking system and aesthetically pleasing vinyl surface, the Light Peak basement floor tile has a durable base made from polypropylene capable of supporting heavy loads. This foundation is built with grooves for constant air circulation, which also forms a thermal barrier effect. These tiles provide a comfortable surface for walking. You may install the basement tiles over chipped or uneven concrete. It may also be installed over any flat surface, including carpet, vinyl or concrete. All things considered, these beautiful interlocking vinyl top basement floor tiles capture the essence an ideal basement floor. Each tile measures at 12 x 12 – inch (1 square foot). The number of Light Peak Slate interlocking basement floor tiles you will need depends on your square footage. The basements square footage will equal the amount of tiles needed to complete your wall-to-wall installation. These tiles may be cut with a jigsaw (fine tooth blade) to fit around any stairways, stand still objects or walls. If you are cutting, it is suggested to add about 6% additional tiles to the amount needed. This will account for the waste. Regardless of a slightly uneven base floor, these tiles can still be installed. The only small preparation required before beginning your installation is to just simply sweep your base floor from any dirt or dust. With a four loop-to-peg interlocking system, the Light Peak Slate vinyl top tiles snap together and remain locked together unless intentionally pulled apart. Due to the easy assembling and disassembling, these tiles make it convenient to remove if flooding, leaking, or relocating occurs. This do-it-yourself installation method makes it possible to complete your basement floor without professional help or professional tools. The compact size and lightweight of each tile helps speed up the installation process. Keep in mind if covering a large basement area, you may want to use knee pads and a small plastic mallet to ease the process. The Light Peak Slate basement tiles are straight-edged on all four sides. Once these tiles are assembled together properly, they form an edge-to-edge appearance, allowing an attractive, tiny space between each tile to allow air to escape from underneath. The base of the tile is manufactured with high-impact polypropylene plastic. This is a rigid and firm material that can support the weight of furniture and equipment without losing its shape or causing any damage to the tile. These durable basement tiles can handle heavy furniture such as sofas, pool tables, television stands etc. 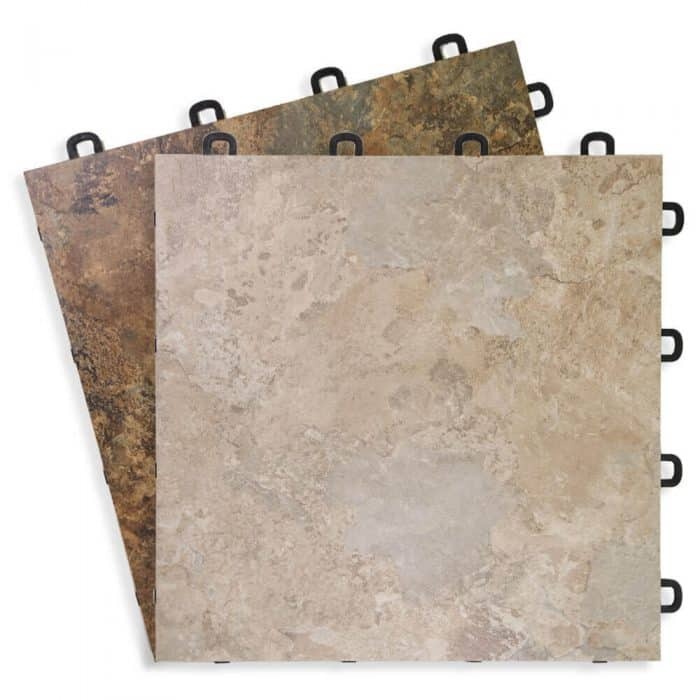 However, this vinyl top tile’s durability doesn’t only lie within the polymer base, but also in the vinyl top itself. It can handle the average basement foot traffic. 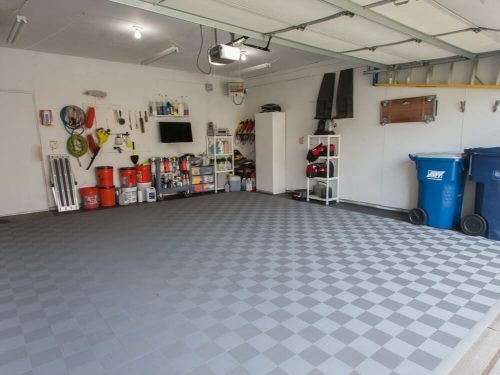 With full UV protection and made to be colorfast, the surface of this basement tile is stain and fade resistant. Given its long-lasting and durable nature, these interlocking tiles do need to be properly maintained. They may cleaned with a Swiffer or with mild soap and water. This will prolong the life of the floor. 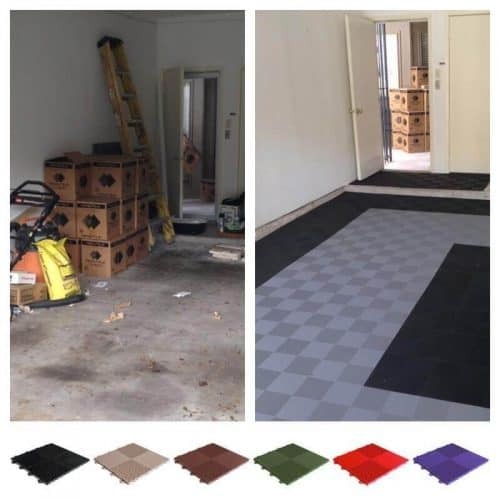 In addition to the lasting vinyl composite material, the foundation of each individual Light Peak Slate vinyl top tile (interlocking basement floor) is manufactured with a mold-resisting plastic known as polypropylene. Furthermore, the antimicrobial polymer foundation has a grid layout underneath to allow air to circulate through the grooves while letting moisture and humidity escape. This ventilation system helps prevent microorganisms from developing on the tile and base floor. One of the most beneficial qualities these tiles have is its convenience and portability. The ease of installation and disassembly, light weight, durability, and attractive surface are all characteristics that can accommodate other applications. A few examples of other uses are trade shows, temporary office flooring and commercial displays. 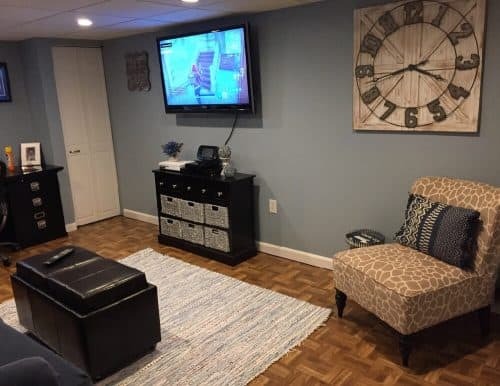 Your next basement-flooring project can be completed quickly and effortlessly. Buy them today! Just add them to the cart and proceed to the checkout page. 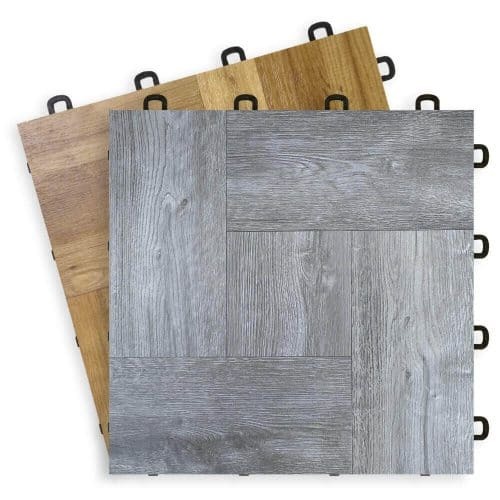 Feel free to browse ModuTile Interlocking Basement Flooring – section to view our other interlocking tiles suitable for a basement flooring option. As always, if you have any questions please feel free to call us at 713-663-6060. 12" x 12" x 1/2"
We love the floor. It was very easy to install. All the videos for cutting the floor show it being bottom side up but there was no way to mark it so we cut it right side up (with a new jigsaw blade) and it worked great. We have gotten many compliments. It does make a little noise when you walk on it but nothing major. Only thing we have found is in bare feet when we shut off the light switch on the wall we get shocked, which never happened before. I have attached some pictures. The pictures do not do the floor justice. We painted the walls blue which there was a hint of blue in the tile and it looks great together. Just thought you’d like to see the results of the modutile installation my wife and I finished this week. The hardest part was carrying the tiles from our garage to the basement….a case of tiles is fairly heavy! Absolutely love these tiles! They went down easy, I laid 550 sq ft by myself, using only a handsaw to cut as required. Took a total of 11 hours (over 4 days). I am installing shoe molding now, will send you pictures soon. Wish my husband & I had discovered these years ago when we originally finished the basement, would never have considered the laminate we went with & had to rip out and waste. purchased 1200 sq ft and delivered to my house within 3 days.UNBELIEVABLE… love the quality and service i received from your company. You will definitely get a referral from me. After discovering extensive mold under our previous basement flooring, we struggled to find a cost effective flooring that was not made of wood products. After weeks searching for an alternative, we discovered Modultile’s website. The company sent out one full tile sample and smaller samples of the other tile colors to help us decide what color and texture would work best for our basement. An online video showed how easy the tiles were to install. The quantity discount pricing on 700 sq. ft. made the decision an easy one. The tiles were shipped in a timely manner and the installation was as easy as advertised. We are very pleased with our new flooring that has the look of stone but the warmth of a wood floor. 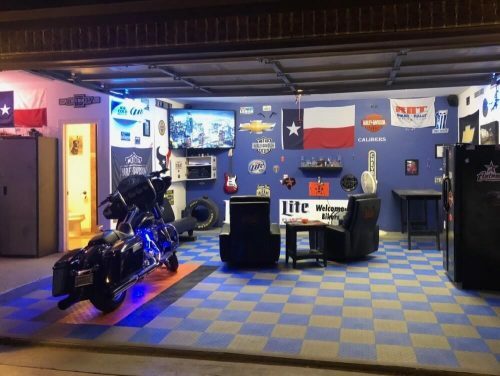 We wish we had discovered this product when we remodeled our basement initially! 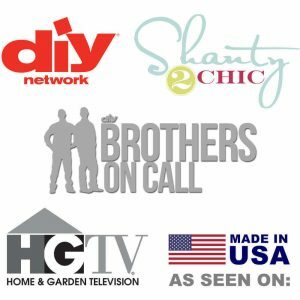 Your team was helpful and I received the materials in a timely manner. I appreciated the samples in making a choice of product. The tiles are well suited as a concrete floor covering for living spaces. I did ceramic tile the bathroom in this area and there is a noticeable difference in the temperature of the floor as you pass from one material to the other. Your product is as advertised. The installation was relatively easy once you get a starting point and direction established. The one good thing is if you do it wrong, you disassemble and do it over. Since the material is true to size and fits tight, you don’t have to worry about laying it the same way you do with ceramic tile. The one thing to keep in mind is you can’t cut and use pieces of this tile like you do with ceramic tile as it is a directional material. The cutting was easy too. I started with a jig saw and switched to a band saw. I hope the laminate itself is tough, but time will tell. I did scratch a tile moving some furniture back in place, and it seemed to scratch just a little too easy. I ended up putting down “coasters” on all the furniture with legs to protect the floor. Some of the coasters were rubber because the couch would move when you sat down. You also have to get used to the “hollow” feel of the floating floor. It is forgiving for some surface imperfections, but only within reason. 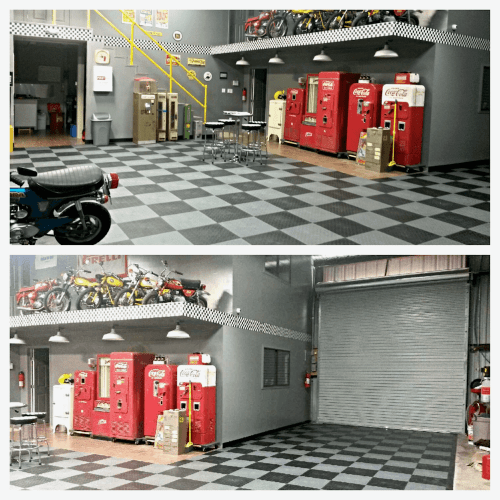 Overall it looks good, but there are better looking floor coverings. The thing is this is for concrete floors, and probably the best material overall you can use. You can’t carpet (or shouldn’t), tile is hard and cold. Other laminates or wood products are more expensive and hard to put in, as well may not perform as well with being laid over concrete. Concrete plain and simple is not a great sub floor. If you have it, you got to work the best you can with it and this is a good product for that. The tiles look good in the basement. They were easy to install. I had to cut around a pole, this was accomplished easy with jigsaw. I just found this tiles while I was looking for basement floor solutions and i ordered a sample tile,liked it and i made the large purchase after .They fit together well .Great price easy transaction. I am quite pleased with the quality of the tiles and how easy they were to install and trim where needed. They look great. I would definitely use them again. I put down about 350 tiles in the basement in a short amount of time. The area included the landing, a hallway, a bedroom, and a closet. Because the areas are joined, I had to do a lot of cutting. A bandsaw with a 10 TPI blade cut the tiles easily without any damage. Excellent product! This was my second basement installation and I was very pleased with the end result, just like the first time around. The only problems that I encountered were self-induced – need to remember to measure twice and cut once. Always a good idea to order some extra tiles to cover the inevitable goof-ups. I used the Natural Canyon Slate and was very happy with the results. It was easy to install and really looks great. I got a price from a basement waterproofing contractor to use the same system. I thought the price was a little steep, so I started looking on-line and found Modutile. Bottom line is that I saved $1500 by purchasing from them and installing it myself. We installed over the weekend, didn’t take much time.wife and i installed it within an hour but we spent some time to cut and fit. You guys saved us a lot! Thanks Guys for the Natural Canyon tiles. I will refer family and friends to you. Take care. $1.89 – $2.29 sq. ft.